I am excited to be blogging to you from my little Paris apartment. I have been sitting at my little desk creating our new website, social media and marketing, and for one year now, working online and all over the european markets buying beautiful offerings for the store, and looking for inspiration everyday in my surroundings. It is simple to find those little things in life here in Paris, that bring us pleasure and deep satisfaction, regardless of what is going on in the world around us. I believe, and have always believed, that the products we bring to you , offer a little taste of simple luxuries that make life more comfortable and worth living. They are what make your home unique, cozy, sensual, and more special than any one else’s. 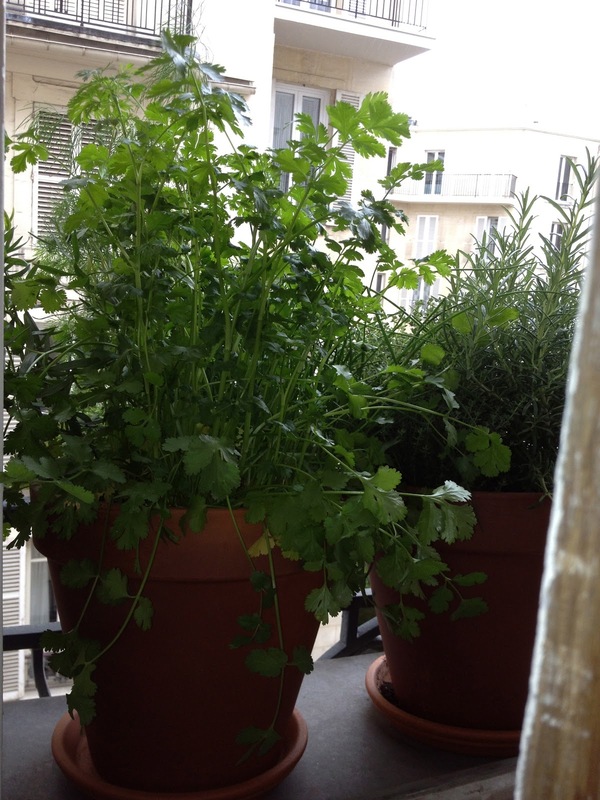 Of course, I have some of those luxuries I have brought from home to make my apt my own, and today, I share some of my Parisian life's pleasures with you. 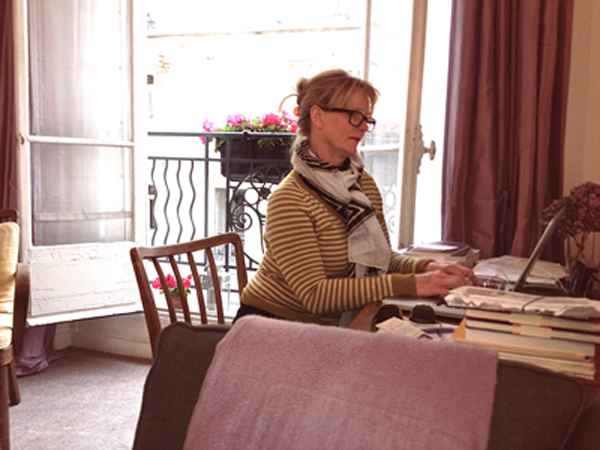 Me blogging and creating at my desk in my Paris apartment. 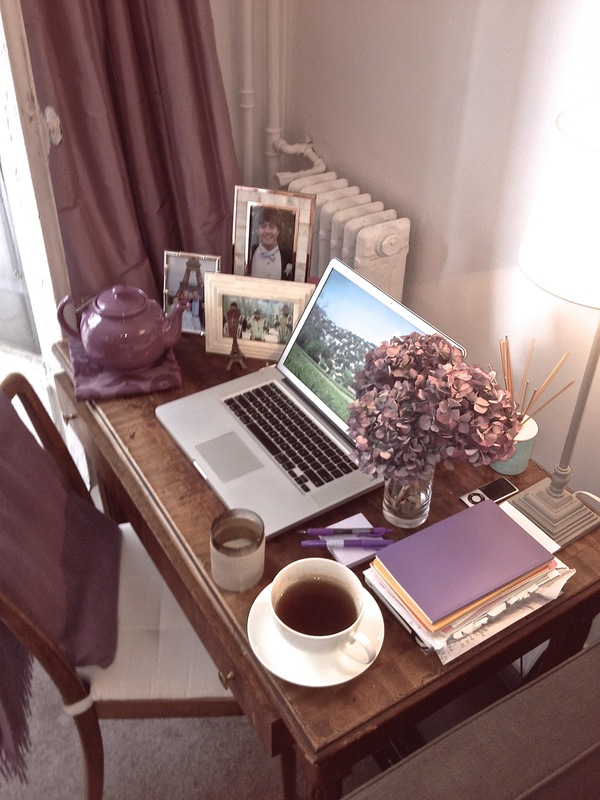 I always wanted to have a purple room in my home, and moving to Paris into a small space was the perfect opportunity to realize this color fantasy! 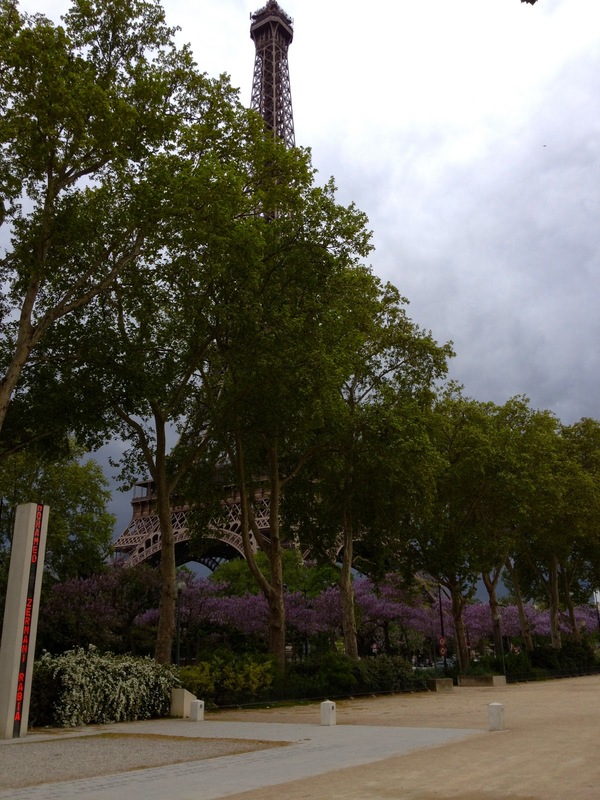 The french love purple, and they know how to make anything purple outstanding, whether the outside of a charming shop, a restaurant's decor, warm and cozy hotel, at the table, or any room in la maison. My curtains are a gorgeous silk in the warmest of purple www.wolfhome.com, and the purple cashmere throw is from Belle Chambre of course! 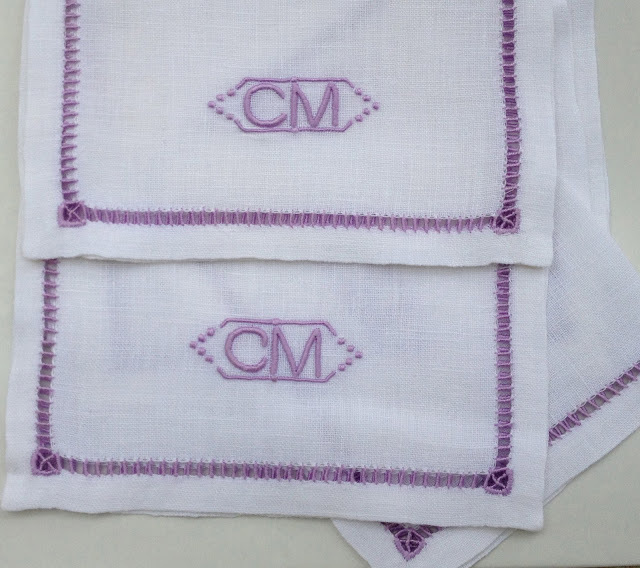 My cuisinette with my favorite purple Le Jacquard table linens and tea towels! 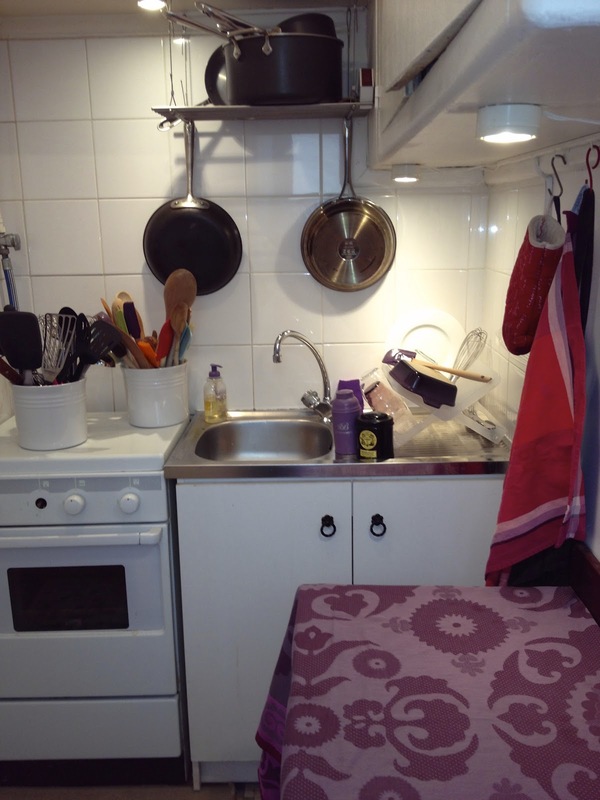 I also found some great purple Le Creuset baking dishes and spatulas to add to the purple theme. My desk again with all my perfect purple finds. Teapot for taking my tea everyday ( it is a ritual for the french at 4:00 pm in the afternoon), Le Jacquard napkin, Moleskin notebooks I use for blog planning, french vocabulary reference, purple hydrangea from the market at Rue Cler just around the corner from my apartment. When you are living abroad, it is very important to have family photos and things that remind you of home. 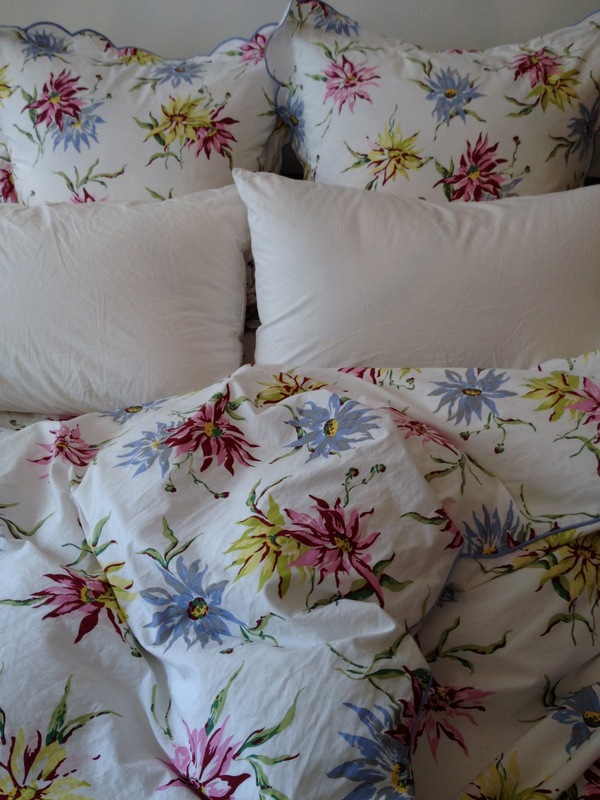 My D. Porthault sheets and Sferra Giza pillow cases that I absolutely cannot live without! The ultimate luxury. 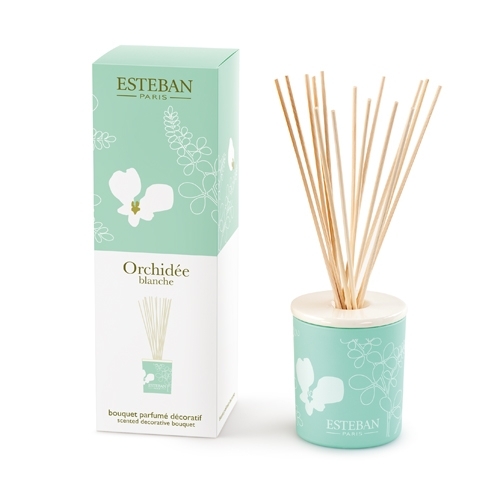 I always have a diffuser in my apartment, and right now, I have the Esteban Orchid Diffuser which smells like heavenly springtime! I am always burning candles, especially at night. Candles give your home such a warm and sensuous glow! 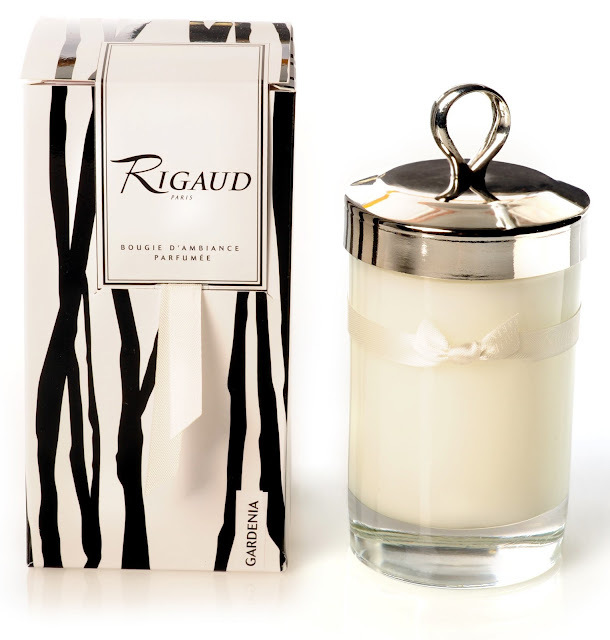 Rigaud is a classic french brand of room fragrances, and their candles have a very long burning life! My Julia B cocktail napkins with custom monogram, a gift from Julia that I cherish! I don't just use them for entertaining, I use them everyday when having a cup of tea or a glass of wine. I believe if we have pretty things they should be a part of our everyday life. My window sill herb pots, all french kitchens have some so that fresh herbs used in recipes are just a clip away. 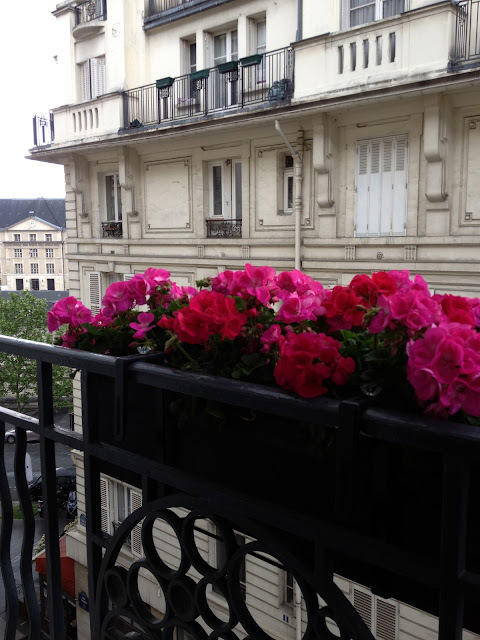 My geranium window box. Imagine opening long french doors into your salon, and having these beautiful colors bring the outdoors inside! They make me happy. Imagine taking your morning walk and stumbling upon such a magnificent site! More purple, love it!